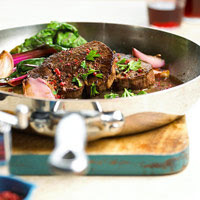 Who wouldn't love this delicious saucy steak main dish recipe that can be prepared in just 30 minutes? Serve with Braised Swiss Chard to complete the meal. Sprinkle steaks with salt and pepper. In 12-inch skillet heat 1 tablespoon butter and the oil over high heat. Cook steaks 1 to 2 minutes, until bottoms are browned. Reduce heat to medium. Turn steaks; cook 6 minutes more or until desired doneness (145 degrees F for medium-rare). Remove steaks; keep warm. Add shallots to skillet. Cook 5 minutes or until crisp-tender. Remove skillet from heat. Add cognac; return to medium heat. Cook 2 minutes, stirring to scrape up browned bits from pan. Add broth. Reduce heat to medium-low. Whisk in 1 tablespoon softened butter until smooth. Return steaks to skillet. Heat, spooning sauce over steaks. Top with parsley and peppercorns. Serve with Braised Swiss Chard. Braised Swiss Chard: Trim stems from 1 pound Swiss chard; rinse and dry. In Dutch oven preheat 2 tablespoons cooking oil over medium heat. Add chard, cover; cook 2 minutes, stirring occasionally. Season with salt and pepper. Makes 4 servings. Calories 434, Total Fat 25 g, Saturated Fat 9 g, Monounsaturated Fat 7 g, Polyunsaturated Fat 6 g, Cholesterol 129 mg, Sodium 763 mg, Carbohydrate 7 g, Total Sugar 2 g, Fiber 2 g, Protein 40 g. Daily Values: Vitamin C 57%, Calcium 11%, Iron 27%. This entry was posted on 10:50 PM and is filed under Beef . You can follow any responses to this entry through the RSS 2.0 feed. You can leave a response, or trackback from your own site.